While yes, you certainly travel some distance when you’re riding in a car you had pick you up, Uber is apparently considering expanding its travel business beyond ride-hailing. A patent filed by the company with the U.S. Patent Office this month lays out Uber’s ideas on becoming an all-in-one travel agent. 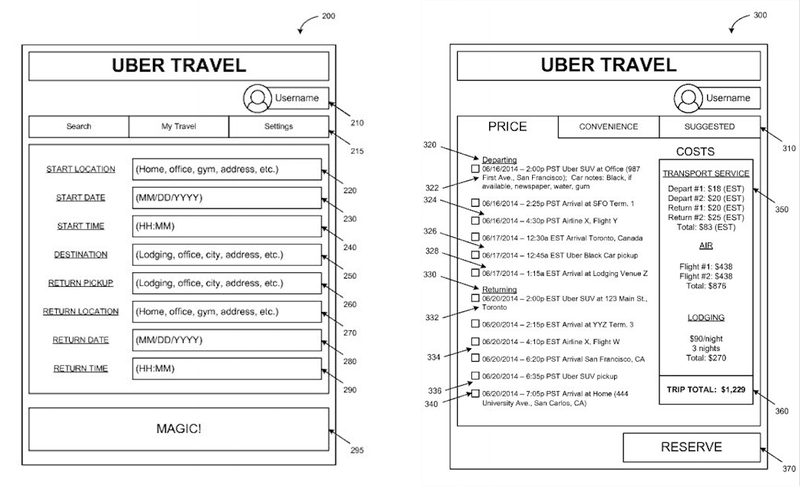 Fittingly enough, the patent images call the service “Uber Travel,” with what looks like a fairly typical flight search you might see on travel sites like Expedia or Orbitz. The Uber part of the whole thing comes in by including cars in the travel plan: a traveler would supply the start location, date, time and destination for their trip and the system would do its “magic” by setting up the flight, choosing a hotel and organizing car transportation to and from different points in the trip, all with one price. Uber says it would tap into the airlines’ information network to take into account things like a plane’s on-time performance and a user’s preference for aisle and window seats. It will also work with hotels and “shared-economy systems” like Airbnb that let people rent out their apartments. Once you’ve got your flight scheduled, the system is designed to track it so that when it actually lands, calculate the time it takes to get your bags and go through customs if that’s included, and then suggests a good time for you to hail your ride. Uber hasn’t commented yet on the news of the patent.